Getting the Picarros up and running has been a journey in itself. As I've mentioned before, scientific equipment doesn't just up and install itself. And boy, you better get it right, or else you might as well just chuck the data or else spend the rest of your life trying to justify corrections and tweaks to the data. My journey started in Australia, where I was lucky enough to spend a few weeks with my now co-supervisor, Dr. Peter Rayner. Peter taught me all the in's and out's of atmospheric inversion and how to go about getting one to run. This was my first experience with working on a super computer, and I think I learnt to code in about three different languages during those six weeks - IDL, Python and Fortran. 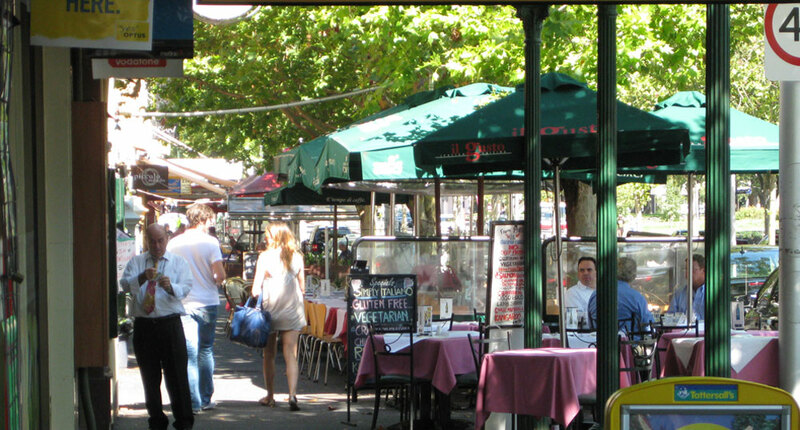 As a bonus, Peter also took me on a tour of Lygon Street, Melbourne. This is a delightful place, which has restaurants of all kinds stretching from end to end. 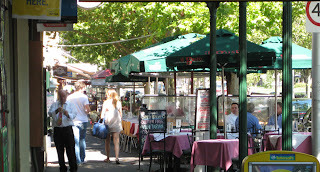 Every day we would visit a different restaurant so I got to enjoy a culinary tour of Melbourne, Australia, as well. I had possibly one of the best burgers ever at a place called Grill'd (http://www.grilld.com.au/). Unfortunately I'm not a ginger, or otherwise I would have been eligible for the special. As an aside - there is a wonderful little cinema in Lygon Street, Cinema Nova (www.cinemanova.com.au/), which I discovered while staying there. It's an arthouse cinema, but they do show some of the movies on the regular circuit. My normal experience at a cinema, which I do love going to in general, is that you get your ticket and then you can maybe get a popcorn and some soda, and not much else. But at Cinema Nova, not only can you get your box of popcorn (so you can have the full cinema experience), but you can order a glass of wine as well!! In a GLASS! This was an entirely new experience for me. There's nothing like a glass of wine to help you get thoroughly enthralled in a soppy movie. Just around the corner from the University of Melboure are the Aspendale CSIRO (Commonwealth Scientific and Industrial Organisation) offices. Peter has a long standing relationship with CSIRO and works often in collaboration with the CSIRO Marine and Atmospheric Research group. Lucky for me! This group manages several atmospheric monitoring sites, including Cape Grim on Tasmania. Who better to ask how to go about setting up my own system? I was hoping for a few pointers and maybe a setup diagram or two. Well I got that and much more. On the day I visited, Zoë Loh (http://www.youtube.com/watch?v=n6313xRIdck) and Ann Stavert (http://www.youtube.com/watch?v=oYmJJerYi-w) graciously and enthusiastically showed me around their labs, and then took me through their entire setup of the Picarro systems, and the do’s and don’ts of plumbing. And on top of that, Zoë arranged for me to go into the field with David Etheridge to see two Picarro monitoring sites in action at a geosequestration site, as well as to get some hands on training in collecting flask samples for isotope analysis. Assistance from CSIRO didn't stop there. I also got to visit the Marine and Atmospheric Research group based in Canberra. This was to get some hands on experience with code related to the CABLE (CSIRO Atmosphere Biosphere Land Exchange) model, which our group in South Africa had planned to start using and adapting for our purpose. This model represents the interactions between soil, vegetation and the atmosphere, and includes linkages between hydrology, plant physiology and their micro climate (http://cawcr.gov.au/projects/access/cable/cable_technical_description.pdf). Vanessa Haverd very kindly took me through all the code and explained how to get it to run. When I arrived back home, it was time to start ordering the bits and pieces. If there was one thing that I had taken away from the trip, it was that it was going to be a lot harder to set everything up than I had anticipated. There are a lot of little parts that are needed to make the whole measurement system run properly. We had decided to go with the same Picarro CRDS measurement systems that our colleagues at CSIRO were using, and Picarro, although thousands of kilometres away were very helpful in getting us all the Picarro bits and pieces that we needed, and never hesitated to call if they needed to explain anything. Once the Picarro’s arrived, it was time for me to sort out the plumbing, It was something that I had been dreading since the Australia trip because I knew that it was more complicated than I had originally thought, and that it could make or break the whole measurement system. Fortunately, just after getting back from Australia, I had the opportunity to attend the conference for the South African Society of Atmospheric Sciences, where I met in person Ernst Brunke, of the Cape Point GAW station, run by the South African Weather Service. Instead of treating me like someone who was trespassing onto his turf, Ernst was happy to explain in any required detail what I needed to get for the plumbing system to work, and also to share and collaborate with his lab at Cape Point. Lucky for me, the suppliers of Swagelok connectors (http://www.swagelok.com/johannesburg), the same connectors used on the Picarro CRDS instrument, were literally just around the corner from where I lived. Here I spent several hours while the sales personal helped to identify all the correct components needed for my plumbing diagram to turn into a reality. They even helped me to assemble the bits and pieces. I now know what a ferrule is. When it came to the actual installation, I needed permission from the Port Authority, Transnet, in Cape Town. Mr. Robin Poggenpoel, regional manager, was glad to get on board with the research project, and provided permission for me to access two of the lighthouses to install the CO2 measurement instruments. With help from my family, and from the lighthouse keepers at Robben Island and Hangklip - Peter and George - I was able to finally get the instruments installed. After about a year of planning, everything finally came together. So as you can see, this research project would not be possible without the help of a lot people, who really didn't have to, but did anyway. Thank you!